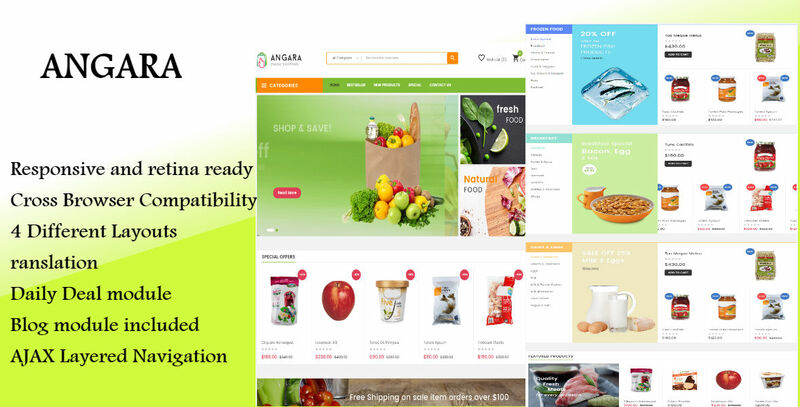 Angara Multipurpose Opencart theme is specially designed for online kitchenware stores, baby shop, sport stores, food stores… This theme is known as a responsive theme which will automatically change width according to screen size. Customers no need to zoom in and out during the shopping time, and you save cost for mobile version. Angara theme has 4 hompages and many great features such as Horizontal and Vertical megamenu; Ajax layered navigation; Blog; Testimonial; Slideshow with nice images, unique effects & nice texts; Static blocks create clean and modern theme. Moreover, Angara comes with lots of built-in functionality that will help you manage your site better, customize easier. The first is Category Tabs Slider extension which displays categories and products in slider with thumbnail images of each category. Products Slider modules such as Daily Deals, New Products Slider, Featured Products Slider,... display new, special, bestselling, top viewed products with nice “New”/”Sale” labels. Next, Brand Logo Slider module shows the manufacturer’s logo and products on each manufacturer. A newsletter subscription form is placed in the footer and newsletter popup, welcoming the users to subscribe to your updates.